This is a pretty cool piece. 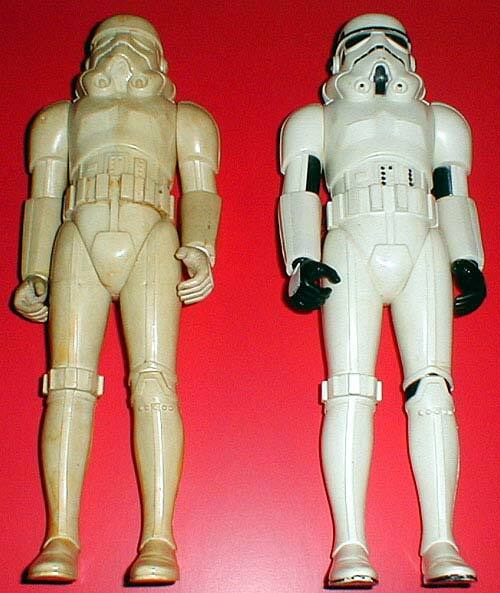 It's a first shot prototype of the large size Stormtrooper action figure. It's interesting for a couple of reasons. Firstly, prototypes of the large size figure line are scarce; it's rare to see a first shot such as this one turn up. Secondly, it's molded in plastic which is colored much differently than that used on the production figure. The principle color of the prototype is an off-white, and the hands are white instead of black. Here's the back. Although it's hard to tell it from these photos, there are no production markings (dates and copyright information) on the prototype. But also note the screw housings-- they're empty. The prototype is held together not by screws but by glue, which, as you can see, has stained the plastic in some areas. Lastly, we have the side. 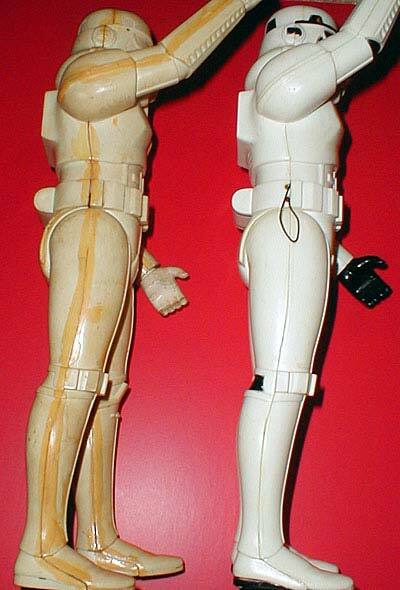 Where the production figure had two small holes stamped in its hip through which the thread "holster" could be attached, the prototype lacks this detail. It may not be pretty to look at, but this piece is definitely one of the more interesting large size figure first shots that I've come across. 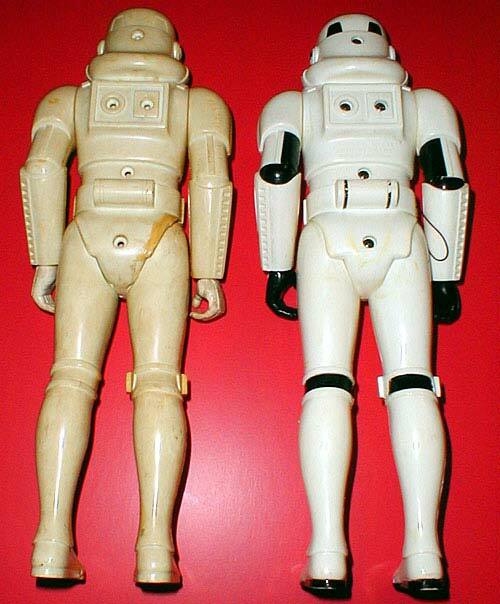 It likely served as an engineering pilot: When the molded pieces that compose this toy were sent back to Kenner from their vendors in the Orient, someone assembled them to ensure that they fit together and everything was in working order.